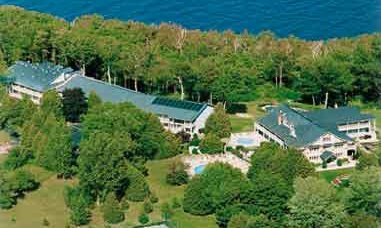 The Country House Resort - Sister Bay, Door County, Wisconsin. An adult retreat with the romance & charm of a country inn and the amenities of an elegant resort on the shores of Sister Bay. 46 rooms and suites, most with private balconies overlooking the bay, fountains and gardens, many with two person whirlpools and fireplaces. 2 night Romance Packages with candle light dinner and massage package or Door County goodies basket - available Nov - April. This and other Door County Bed and Breakfast Inns can be found here in The Register.